We’d love your help. Let us know what’s wrong with this preview of Waking the Giant by Bill McGuire. To ask other readers questions about Waking the Giant, please sign up. 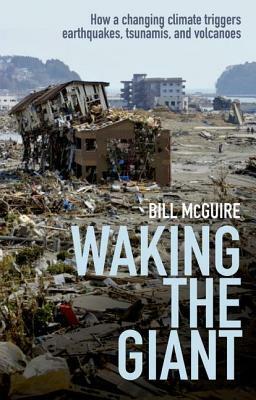 Bill McGuire, a Professor of Geohazards at University College London, wrote the 2012 work of nonfiction that is entitled “Waking the Giant: How a changing climate triggers earthquakes, tsunamis and volcanoes. A detailed description of the interconnectedness of our earth’s systems described how humans affect each of these systems. The book argues the fact that our planet is experiencing a dramatic change over the last 20,000 years; civilization of humans and industrialization is causing our plane Bill McGuire, a Professor of Geohazards at University College London, wrote the 2012 work of nonfiction that is entitled “Waking the Giant: How a changing climate triggers earthquakes, tsunamis and volcanoes. A detailed description of the interconnectedness of our earth’s systems described how humans affect each of these systems. The book argues the fact that our planet is experiencing a dramatic change over the last 20,000 years; civilization of humans and industrialization is causing our planet to warm, resulting in the melting of our world’s ice sheets, causing isostatic rebound that causes the abundance of earthquakes, tsunamis, and volcanoes. To support his argument, he cites studies by other scientists to support his claim that humans are damaging our world through the emission of fossil fuels in our environment, thus warming the planet that is causing an increase in natural disasters due to these geophysical events. Through out each chapter, he progressively introduces a new topic to our understanding of earth’s systems from the basis of earth’s beginning. For example, the author included the beginning of our earth while describing periods of inter-glacial and glacial periods that led up to the existence of humans. The reason why scientists are so worried about the future because they have previous evidence of humans in earth’s past. We know that humans have caused in increase in greenhouse gases, our planet tries to maintain homeostasis, and our planet has experienced warming before, but our planet is populated with billions of people that will be effected by global climate change if we don’t acknowledge our planet is changing and these disasters will have some effect on us in the very near future. And this concept is alarming to McGuire, which is one of the compelling reasons why he published, “Waking the Giant,” and why I picked to read it. Besides talking about the increasing global temperatures, McGuire expressed how the natural processes, like earthquakes, volcanoes, and tsunamis might become more frequent and violent all across the world, but specifically in Alaska where glacier melting is already occurring at an terrifying rate. If humans don’t change their relaxed state of mind and way of life, there is going to be an increased number of natural disasters that will threaten many human lives. After analyzing millions of years of geologic history, McGuire drew the conclusion of how volcanic eruptions and collapses are stimulated by the disappearance of large ice sheets. Since the ice in glaciers is heavy, the water redistributes itself throughout the planet, thus affecting sea level and crust stability. As a result of the weight lifting off of the continents, the concept of isostatic rebound, or the “bouncing back” of the Earth after the crust was buried beneath kilometers of ice, can cause earthquakes and volcanoes in unstable zones, thus awakening the sleeping giant beneath of feet. Besides the concept of isostatic rebound, the rising temperatures can cause increased rainfall, resulting in the increase of the occurrence of landslides. Both chapter 11 in our textbook about our dynamic planet and McGuire used the same example of the changing Alaska. Researchers from the Geophysical Institute at the University of Alaska-Fairbanks used a variety of global positioning receivers to measure isostatic rebound of the crust following the retreat of the glacial ice following the last ice age cycle. This rebound unloaded a lot of weight off the crust. The scientists anticipated finding a slowed rate of crustal rebound in SE Alaska as they compared the rapid response of the first receding ice in the past. Instead, they discovered a rapid vertical motion on the Earth, averaging 36 mm, which is nearly an inch and a half per year. The scientists’ associate the quick rebound to the glacial ice melt and it’s melting over the past 150 years and the record warmth across Alaska. McGuire uses this example to reintegrate his point that our world is warming and vicious cycles could cause the increased activity of earthquakes and volcanoes in the future across the earth. The giant is currently sleeping right now, but appears occasionally out of nowhere, like the 2004 Indian Ocean Tsunami. In the past ten years, there has been an increased awareness of the natural disasters that occur all around the world, like the 2004 Indian Ocean Tsunami. When this tsunami broke news, McGuire was shocked how much our planet has complete control over itself and we are at the mercy of our earth. In addition, these disasters can occur anywhere and will only increase as our climate in changing while humans seem to be the cause. Being that McGuire used terminology and news stories that I could relate to, I could better understand the material and concepts that he was talking about. I would recommend this book to people who want to learn more about Earth’s history and become educated on what is occurring on our planet. The only thing I disliked about his book is that is tended to repeat himself a lot. I understood the theme of his book within the first couple chapters and the theme was repeated as each chapter began, making points redundant at times. That being said, the book could have been condensed down by a few chapters. I understand that a scientific community will analyze his book and McGuire wanted to add as much evidence from other scientific sources to support his argument. After reading the book and analyzing its pros and cons, I would definitely recommend the book because I learned so much that I didn’t know before. Our Earth is changing and we are responsible for making a difference for preserving it for the future. This was fascinating. I do think that the blurb rather oversells the connections that McGuire is making (most of the climate change impacts on geophysical disasters he discusses are fairly subtle, at least in the short and medium term), but the book is one of the best and most accessible accounts I've read of what we can learn from paleoclimatology about the consequences of anthropogenic climate change. A partly terrifying and entirely fascinating study into the distinct possibility that rapid changes in ice and water levels as well as weather (as currently being experienced under the anthropocene) leading to an increase in volcanic activity and earthquakes. This shows the interconnected nature of earth science and human influence on the planet as well as the much overlooked activity of the Earth's crust which is not located on major plate divisions. Well-written and fascinating in a terrifying sort of way. Stalwart! A must for anyone concerned about the climate crisis. William J. "Bill" McGuire (born 1954) is Emeritus Professor of Geophysical & Climate Hazards at University College London and is one of Britain's leading volcanologists. His main interests include volcano instability and lateral collapse, the nature and impact of global geophysical events and the effect of climate change on geological hazards.